Buy LeTaraWrites a Coffee. 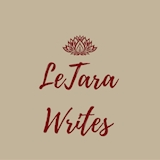 ko-fi.com/letarawrites - Ko-fi ❤️ Where creators get paid by fans, with a 'Buy Me a Coffee' button. I write from the heart. Though I classify my stories as fiction, they're always inspired by very real experiences and emotions. My writing is often reflective and thought-provoking, as my random thoughts tend to be. Secured Payments. Support goes to LeTaraWrites's account. Upgrade LeTaraWrites to a yearly Gold Membership with a one-time payment.